A crowd, incited by a Salafi leader, attacked the church of Saint Georgas. The Cross on the dome destroyed, part of the interior and the sacred images devastated. The police witnessed the violence, but did not intervene. Fr. Domadios saved by a Muslim family. In recent months, extremists had opened a hole in the wall to "monitor" his activities. Cairo (AsiaNews / Agencies) - A mob, incited by local Salafi fringe, threw stones and set fire to the church of St. Georgas in the village of Sarsena, Tamiya District, in the Egyptian province of Fayoum, about 103 km south-west of Cairo. According to sources of the Assyrian International News Agency (Aina), the attack took place yesterday evening and caused damage, particularly to the dome of the place of Christian worship. The attack destroyed the towering cross on top of the building, and many of the icons and sacred images inside. The local Salafist fringe lead the attack against the Copts, pitting the Muslims against the community, branding the church as "illegal", because it is close to an area inhabited by Muslims and "for this reason has to be removed." They are imposing the demolition of the building and have prevented the priest, Father Domadios from entering. Some witnesses reported that the scene was also attended by police, who did nothing to prevent the violence. The church of St. Georgas was built in the mid-80s and is a point of encounter and prayer for 200 Coptic families. About three months ago, some Muslims made a hole in the wall, to "monitor" the activities of Christians. Yesterday the priest's attempts at mediation proved worthless. He was joined by the local police chief, who arrived on site to try to find an agreement between the parties. 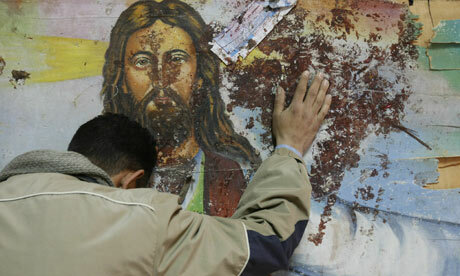 Firm in their positions, hundreds of Islamic extremists - in front of the police - started throwing stones at the church. The attackers injured - not seriously - some Copts and Father Domadios, who managed to flee to safety with the help of a Muslim family aboard their car.